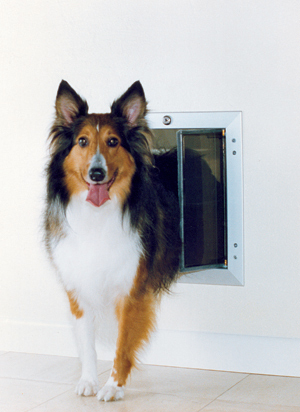 Plexidor Pet Doors: What size PlexiDor should I get? What size PlexiDor should I get? I post about pet door sizes from time to time, because this is one of the most common questions that come my way. People will look at the pet door and say, "That's so small. No way my dog/cat can get through." The door does not need to be as tall as the pet. It has to be wide enough to let the pet through, of course, but it doesn't have to be as tall as the pet. Check out the image to the right of a Collie standing in a door. The door isn't flush with the floor. It could be, but you want a small hole to help keep weather outside. Theoretically, a dog door could be as tall as the dog. Imagine a Great Dane. That would be a large hole in the door or wall! A door that size would also become heavy for the pet to open. Generally, the pets duck their heads a little while going through the door, and they lift their feet to step over the threshold. Thus, if you measure your pet and think, "Oh no, there's no door tall enough for my dog" it will probably still work. If you have larger and smaller pets together, the panels on the PlexiDor swing so easily smaller dogs and cats can usually open even large doors without problems. To make sizing easier, we have put together a convenient sizing chart, see below. 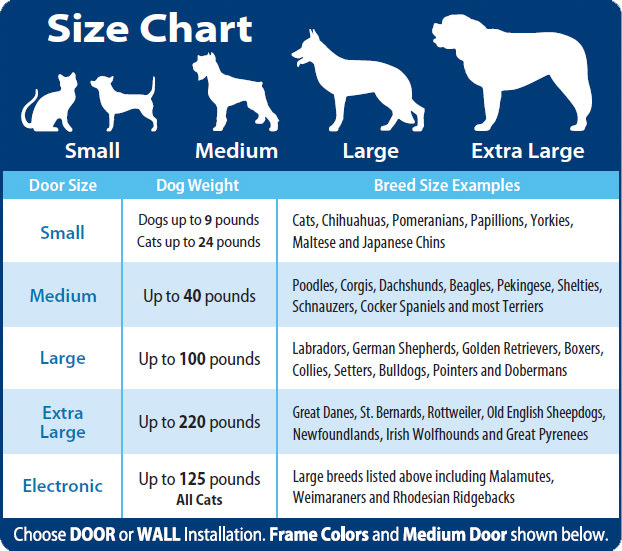 Some breeds have great variations in size, of course, so see the breed examples as general guidelines. Good point! You automatically think it needs to be as tall as the dog, but that is not the case. I'm so excited that I chose the right size pet door for our dogs. It's perfect! Can I put a dog door through the wall? Where did the dogs come from? Stay safe in the dark. Do big cats like catnip? A pet door can be secure.